Dare to be different? Clearly, custom is the way. Leftfield design and body shape; great build; evocative sounds; stable Bigsby performance. It’s not cheap, but would a £3k super-guitar from high-end brands be as individual as this? Walking around this year’s NAMM show, this writer was dismayed to see an awful number of great guitars all based on four or so classic designs. 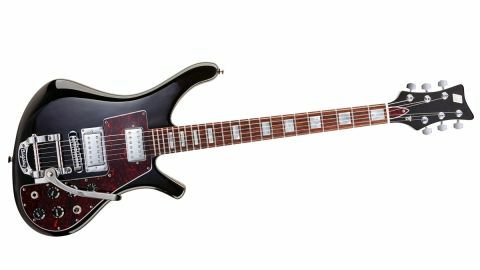 Everywhere we looked we saw ‘Strats’, ‘Teles’, ‘Les Pauls’, ‘ES-335s’ or ‘330s’ and many, many ‘new’ designs were more often than not based on old ones. Whatever happened to innovation when it comes to our instrument? It’s a timely refresher, then, that Cumbria-based maker Graham Skimming got in touch and shipped us his Paradox model - originally offered as a limited-run ‘Old Nick’ model conceived for, and with, ex-Verve guitarist, Nick McCabe. Pulling the Paradox from its smart semi-flight hard case, we really aren’t expecting something so, well, out there. Pulling the Paradox from its smart semi-flight hard case, we really aren’t expecting something so, well, out there. The slightly Ricky bass-inspired body seems too small, the neck over-long. We tune up, plug in and...are totally absorbed for the next two hours. Any thoughts of copy deadlines drift away. Quite astonishing. So what exactly is the Paradox? Based around a quarter-sawn, neck-through spine of sapele, the Paradox’s elegantly waisted design is deceptively simple, its ‘bling’ reserved for mother-of-pearl block inlays on the unbound rosewood ’board, which sports a flatter compound radius and do-it-all medium jumbo frets, plus a neck shape that is a beautifully rounded ‘C’ that fills out as you move up - just like it should. There’s a balance, both seated and strapped - one that almost belies its appearance. Part of Graham’s design, due to Nick’s prior taste of “famously playing Strats and Les Pauls”, was that he wanted to find “that middle ground and aim for the best of both worlds in a single instrument”, explains Graham. Visually, though, the twin-humbucker/four-control with three-position toggle pickup selector layout hints at the later benchmark. However, pull-push switches on the Strat-knobbed volume controls apply splits (voicing the neck-facing coil of each humucker), plus, in the position of the volume control on a Strat is an unusual flared knob, a master volume. Strapped on, the neck seems to sit into your body a little more than a Strat and our usual sight line down to the 12th fret is more like the 10th. Subtly different, but no problem. As with many Les Paul/Strat hybrids, we end up in that wonderful sonic space between those two cornerstones: the Paradox is no different. Do the coil-splits sound like a Strat? No. Do they sound single coil-y? Yes. Same with the ’buckers. Combine those voices with the neck- through design - which, yes, does contribute for a long sustain - and already the Paradox is moving into its own sonic space. We also hear quite an all-mahogany ‘Gibson’ sort of sound, almost like you’ve cocked back your wah pedal a touch; it’s a little more ‘direct’-sounding and a little less woody than our reference PRS McCarty. Sound references aside, the proof is in the playing and listening, and on so many levels the Paradox is exceptional, moving from those single-coil voices to tougher, classic rock beef from the ’buckers, while that master volume, as any Strat player will attest, is just superb for those Beck-like swells that are somehow more immediate than using just a volume pedal. It’s a fine guitar with musical, organic sounds, plus the endorsement of one of the most visionary guitar players that we’ve ever heard. Like a Gretsch or Guild semi, you can set your controls and ‘drive’ from that master control, too - a good thing here, because more conventional control changes are certainly hampered. But the Bigsby is superbly sorted. To our ears, this is less a Strat/Les Paul hybrid, more a guitar that references both camps but ends up with its own quite compelling voice. In many ways, this guitar reminds us of the long-lost era of guitar design when different was best. It’s hard to imagine any mainstream company creating something quite as out there as this - unless, of course, it was an obscure design from the 60s. Yet along with an extremely good build, it’s not only hugely individual, it’s a fine guitar with musical, organic sounds, plus the endorsement of one of the most visionary guitar players we’ve ever heard. In this Custom spec, it’s far from cheap, but the whole package is, for the right player, hard not to like.